There are so many slow juicers in the market, which one should you get? We narrow down a few slow juicers here for you that are worth considering when thinking of buying the best juicer. You asked, “What juicer to buy?”. We hope this article will help you decide on the “best” juicer to get. We recommend only slow juicers for safe juicing and append here our experience from using different single-gear juicers over the years. Then, there are cheap juicers—should you get one? You decide what is “best” for you, according to your lifestyle and budget. The juicers we will be talking about on this page refer to single-gears, also known by other names such as masticating juicers, or slow juicers. For ease of writing and understanding, we will refer to them as slow juicers. Read about how single-gear juicers work. The first slow juicers invented were horizontal juicers and had been a hit when they were first sold in the market for the quality of juice and high yield, ease of use and washing-up. 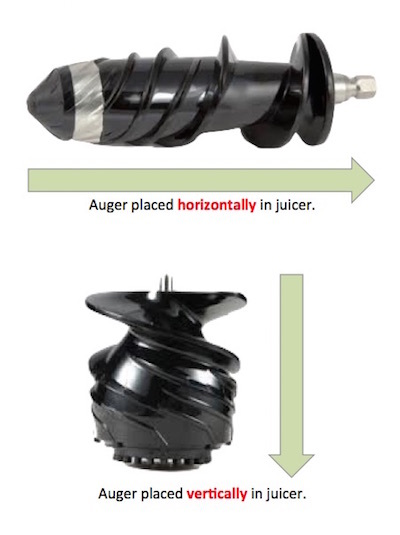 They are called horizontal slow juicers because the gear/auger/screw is placed horizontally in the juicer. Comes in an ingenious nifty cubic design that houses all attachments and accessory cone and nozzles, and larger feeding chute. Has the largest feeding chute among all horizontal slow juicers. Great feature that saves you time on preparation, easier and almost effortless juicing. One of the earlier horizontal models that uses GE Ultem material for its auger that is said to be 8x hardier than its predecessor. 2nd generation and classic model that has been in the market for the past decade. It’s the least expensive slow juicer in the Omega J8000 series. This juicer is identical to the Omega J8003 (above) but is marketed as the Alpha Juicer in Malaysia. Read a more comprehensive review between these two juicers on this page. 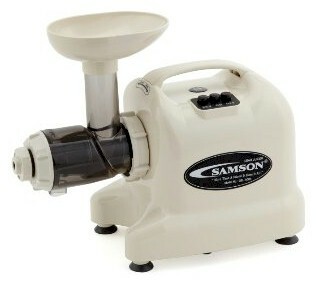 This is an old favorite—the earliest slow juicer design with improved auger, marketed by Samson. Its body is a little bulkier than the Omega J8003 but a very solid machine. Cheapest horizontal slow juicer in the market, at under $200. Vertical slow juicers were later inventions that came into the market to give end-users more options and they were being promoted rather extensively. The designs are different from the horizontal juicers, yet using the same concept of slow juicing to preserve enzymes and nutrients. Many “wannabe” vertical designs had failed miserably, so we trust only renowned brands for their durability and quality. A couple of them that we used (no mention of brand/model here) kept breaking or produced low quality juices, so it is important to choose a good, reliable juicer to have a long-term, pleasant juicing experience. This is the first slow juicer in the world that has a large feeding chute (3-inch diameter) that can take in a whole small apple. Its construction is solid and of good quality. Great for heavy duty juicing but also comes with a big price tag. We trust this vertical juicer simply because it is an Omega, a company that produces quality juicers. This juicer was the most popular vertical juicer before Kuvings came into the market. It is still a great choice if you are looking for a vertical. This vertical juicer’s popularity runs a very close parallel with the Omega VERT. It is marketed rather aggressively and there are mixed reviews. If considering this machine, check the reliability of your local distributor. This Hurom (launched in June 2016) is an upgraded model that is expected to be Hurom’s next best seller. Breville is a quality centrifugal juicer producer, and this model is their first and only slow juicer. It is a popular choice among Breville juicer users who wish to upgrade from their centrifugal to a slow juicer. Worth considering. The Green Power Kempo is one of the oldest twin-gear juicer designs but has survived all this time and still stands solid due to its reliability as a work-horse that produces superior juice quality. This is a high-end gear juicer. These are premium twin-gear juicers that are fully made of stainless steel. This very fact alone elevates these sophisticated beauties above all other juicers. Not for the faint-hearted! As the name implies, this is the ultimate juicer, working on a hydraulic cold press method, produces outstanding and unequalled juice quality. High price tag and used mostly by cancer patients on Gerson Therapy. So there you have it, all the “best juicers” on one page to make your decision-making easier. Click on each one to read more about their specifications and price tags. Let us know if this page was helpful for you and which juicer you end up with! Thank you for your informative page on cold press juicers. I’m confused between buying the Omega horizontal or Omega vertical juicer. If I’d like to use a cold press juicer for fruits and vegetables which would you recommend? I’m very confused with some reviews which say a vertical is better for fruits but a horizontal is better for vegetables. So confused! Please help. If horizontal would you recommend the Omega NC 800 HDS/900 HDC over the 8006? And if vertical would you recommend the Omega Vert 330/350 HD over the 843? Hi Marushka, what you read is correct, that the vertical is better for fruits, and horizontal is better for vegetables! But, if you’re doing both, the horizontal wins any time. Most people juice both fruits and vegetables. I’ve used both vertical and horizontal juicers extensively and always fall back on my Omega horizontal juicers for two key reasons: They produce awesome tasting juices, and they’re easy to use (assemble, dismantle, operate, clean-up). Between the NC 800/900 and 8006, both are good – it depends on how much you’re willing to spend, as the NC800/900 are the “next generation” from the 8006. Hope this helps! Sara, I want to thank you for being so wonderful to share your knowledge with all of us. I would like to know what the best juicing I can do for my menopause and melasma. Thank you for your time. Hi Kimi, over the years I have learned that “stubborn melasma” is a symptom of gallbladder stones. You may want to start to detoxify first with a gastrointestinal cleanse, then followed by gallbladder cleanse. Click on the links on this page that will explain everything to you, step-by-step on how to perform the cleanses: https://juicing-for-health.com/how-to-detox. Hi Sara, I read in some articles that in order to get the same amount of juice from a horizontal masticating juicer, you would need to run the pulp through the juicer again, which will effectively adds wear and tear to the machine resulting in less actual juice during the machines lifetime. Is it correct in your opinion? Help me decide between horizontal and vertical masticating slow juicer. Thank you for your time! Hi Franky, I’m not quite sure I understand your question. However, a good horizontal masticating juicer, such as the Omega J8000 series, produces very high juice yield, expelling quite dry pulp. There is no need to run the pulp through the juicer again as it is just very messy, and you won’t get any more from it. If you asked me, between a horizontal and vertical slow juicer, I will choose a horizontal anytime for these reasons: Easy to assemble/dismantle and wash up, produces high juice yield (dry pulp and no wastage), rich and concentrated juice that can keep for up to 5 days, and easy maintenance – hardly any breakage if you handle with care. Hello Sara, thank you so much for sharing your wonderful knowledge with us! Could you tell me how can horizontal slow juicers be used as multi-purpose food processor? If that works, so I could give my processor away. Always hope my kitchen could be bigger. ? 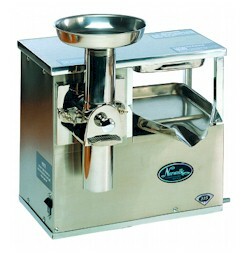 Hi Ling, for example this juicer: https://juicing-for-health.com/alpha-juicer (a horizontal juicer) is able to juice, make nut milk, mince, grind and make pasta. Hope this helps!